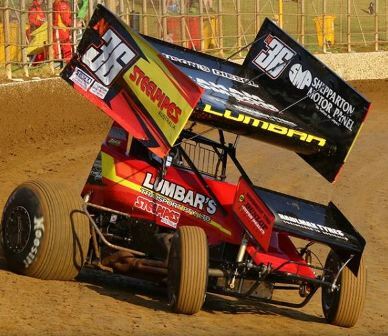 The Sprintcar Racing Association of Victoria heads to Heartland Raceway this Saturday night for round two of the Indy Race Parts 360 Triple Crown Series Challenge with a quality field of drivers entered that will be headed by Brett Milburn and Matthew Reed. Both Matthew Reed and Brett Milburn have a few things in common when it comes to sprintcar racing, both drivers are Eureka Garages & Sheds Sprintcar Series Champions but they are both accomplished 360 Sprintcar competitors and have taken many victories in this class. Brett won round one of the Indy Race Parts 360 Triple Crown Series here at Heartland Raceway last season, Heartland Raceway is normally a happy hunting ground for Brett, a strong showing is expected. Now Matthew Reed has been racing both open and 360 Sprintcars for some time with great success, at round one of the 360 Triple Crown Series at Simpson a few weeks back Matthew took a strong second place to follow up on a recent victory in the Allstar 360 event at Horsham, Matthew must go into the event as one of the favourites. Micheal Tancredi is a two times SRA 360 Sprintcar Champion and has the pace to run at the front of the field to challenge for the round win. Now Michael will be joined by another former SRA 360 Champion, Chris Solomon. Chris is always on the money in his 360 sprintcar whether it is in 360 competition or open sprintcar racing. In round eleven of the Eureka Garages & Sheds Sprintcar Series Chris drove thru the field with his 360 power plant in to take third place against the open sprintcars. Don’t discount Chris for a shot at taking out the feature race win. Deniliquin’s Eddie Lumbar whose company Lumbars Transports is presenting this round of the Indy Race Parts Triple Crown Series has also been doing a few 360 events this season. Eddie top point scored this season at SRA 360 Gold Cup at Western Speedway Hamilton to give him the front row start but mother nature ended his hopes of a good run when the feature race was cancelled before it started. Eddie will be out to show some of that good form he has been having in his 360 sprintcar this season and will be looking for a podium spot. One driver that could nearly call Heartland Raceway his home track is Jesse Nicholas from Nalinga, this young driver is one of the characters in the sport that is happy go lucky but when it comes time to race Jesse is fast and he could be a top five contender. Other hard chargers nominated are Terry Kelly, Michael Cunningham, David Donegan and Chris Campbell, a good showing from any of these drivers will not be a surprise. Marcus Green has been given the opportunity to step up from his wingless sprint into the Skidmore Brother 360 sprintcar for a couple of shows, while this will be Marcus’s fist night out in a sprintcar the wide open spaces of Heartland Raceway will help him come to grips with the sprintcar. Another rookie driver into the sprintcar ranks this season is Troy Hose, Troy and his family are thoroughly enjoying their rookie season and are happy to keep learning each night out. Two Bendigo peddlers Daniel Scott and Darren Clark have also nominated for this round of the Indy Race Parts 360 Triple Crown Series doubling as the Lumbars Transport 360 Challenge. Saturday night Heartland Raceway is the place for Sprintcar action along with the running of the Victoria Super Sedan Title plus other support classes. Round 2 - 6/4/2019 – Heartland Raceway Moama - 360 Sprintcar Challenge.